The United States Mint this morning officially announced a release date of Thursday, June 10, for the 22-karat 2010 American Eagle Gold Bullion Fractional Coins. 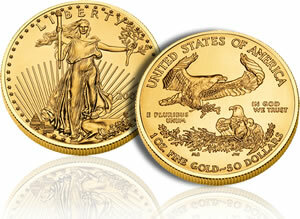 The one-ounce Gold Eagle went on sale January 19. Buyers have sprung at the chance to scoop them up. 190,000 were sold during May, which was the highest sales level since 1999. The fractional sizes that will be available include the one-half, one-quarter and one-tenth ounce. The US Mint indicates they will be offered for sale through the "standard allocation process." As has been the case for all US Mint bullion coins this year, demand for the fractionals is expected to be exceptionally high. The 2009-dated versions were released on December 3. Sales exploded. On that day alone 345,000 were sold for a total of 58,000 ounces of gold. The Mint sells bullion coins for a small amount over the current spot price of gold, but only to authorized purchasers. The authorized purchasers in turn resell the coins to coin dealers, precious metal providers and/or directly to the public.